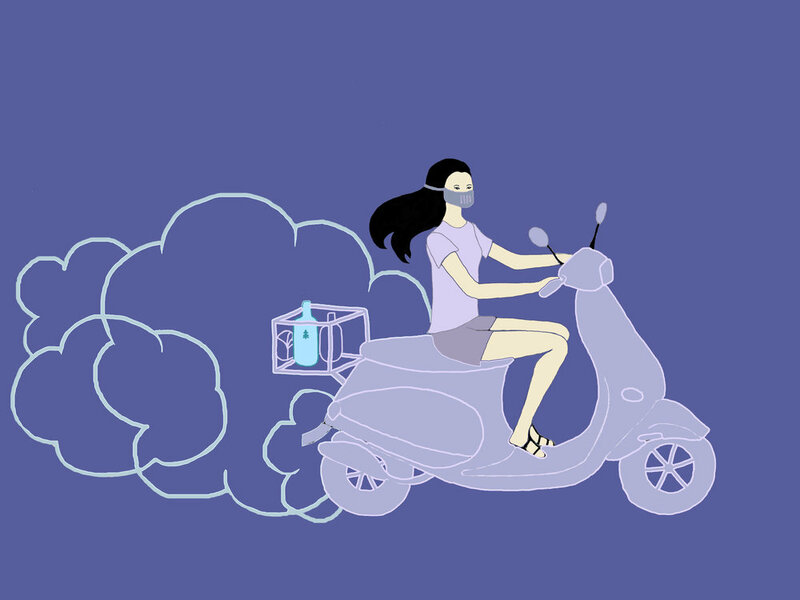 Kai Li headed to the market on her moped, her breath regulator mask tightened on her face. Baba always tells her to take the old, rusty bicycle instead, but she loves the way her hair flows behind her as she races down the street. A white man was hawking something loudly in the market, so Kai Li steered closer to eavesdrop. She picked up a bit of English listening to the Hollywood transmitters, which played weeks late in China. Kai Li watched a woman in a business suit exchange cash for fourteen liters of air. The woman rushed out of the market. After haggling for a melon, edamame, a head of cabbage, and milk, Kai Li passed the air hawker again. She was intrigued, and counted the rest of her cash. Enough for one bottle, which meant she wouldn’t be able to afford groceries for another three weeks. If the business people were already buying bottled air, it couldn’t be a hoax. Back on her moped, Kai Li tucked the air bottle between the cabbage and milk. The bottles clinked together. Kai Li unpacked the groceries, rushed to her room. She unhooked her breath regulator and laid it on her bed. She uncapped the Canadian air bottle, put her nose to its nozzle, and pushed a blue button. She inhaled and pictured a large lake with snow-capped mountains. The air smelled different, sweeter, like it had been packaged with wisps of cotton candy and peppermint. Kai Li heard someone rattling dishes in another room. She tucked the bottle of air behind her back and found nainai in the kitchen starting a pot of soup. She watched her slowly peel carrots, slice them quickly, and toss them into the boiling pot of water. Kai Li brought the bottle out from behind her and showed nainai. She beckoned her to put her nose on the nozzle and then she pressed. She inhaled and pictured a large lake with snow-capped mountains. “Canada? How did you get air from Canada?” Nainai was losing interest and grabbed a wooden spoon. Nainai huffed and Kai Li could see she was now focused on the soup. Maybe baba would appreciate the sweet air. He always huddled up inside when the smog covered the city for days. “Filters won’t work on this,” he’d mutter, shoving a new layer of soaked washcloths underneath the windows and doors. Kai Li brought the bottled air back to her room. She stuffed it underneath her underwear in her dresser so she’d see it every morning. She’d save the sweet air for a bad smog day and share it with baba. Marlena Chertock has two books of poetry, Crumb-sized (Unnamed Press, 2017) and On that one-way trip to Mars (Bottlecap Press, 2016). She lives in Washington, D.C. and serves as the poetry editor of District Lit. Marlena is a graduate of the Jiménez-Porter Writers’ House and uses her skeletal dysplasia and chronic pain as a bridge to scientific poetry. Her poems and short stories have appeared or are forthcoming in Breath & Shadow, The Deaf Poets Society, The Fem, Paper Darts, Wordgathering, and more. Find her at marlenachertock.com or @mchertock. From the back woods to your ears . . .